Hire enough ex-ATIers and you’ll end up really caring about GPU performance apparently. It’s good to see that Apple still views increasing GPU performance as non-negotiable, even at the MacBook Air level. Discrete GPUs are out of the question in the MacBook Air, so all models ship with Intel’s on-die processor graphics. More importantly, all CPU choices integrate the largest GPU offering: Intel’s HD 5000 (aka GT3). Clock speeds alone prevent the 40 EU GPU implementation from being called an Iris 5100. 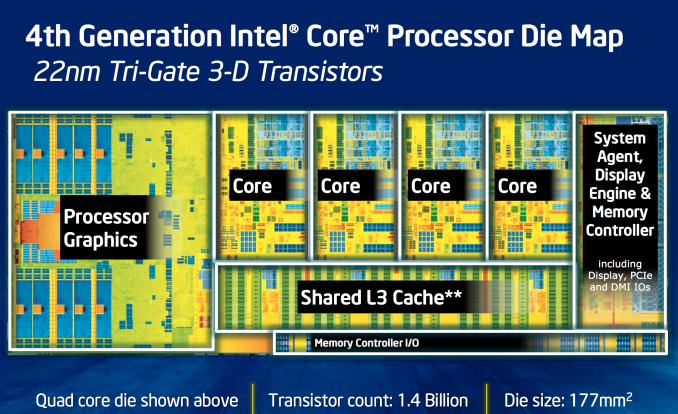 Given the 15W TDP limit, Intel wouldn’t be able to do the Iris name justice even if it tried. 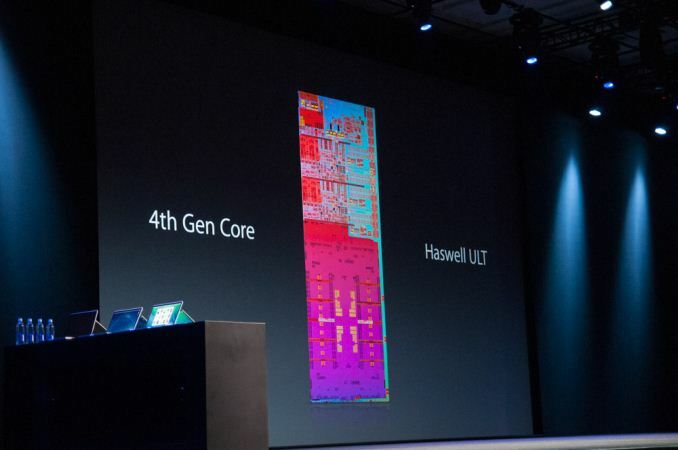 It’s hilarious that Intel refused to give out die photos for anything other than quad-core Haswell GT2, citing competitive concerns, yet at Apple’s WWDC launch of the new MacBook Airs we got to see the first die shot of a dual-core Haswell GT3. Update: I stand corrected. Intel posted its own shot here. Similar to the CPU discussion, on the GPU front Haswell has to operate under more serious thermal limits than with Ivy Bridge. Previously the GPU could take the lion’s share of a 17W TDP with 16 EUs, now it has 15W to share with the PCH as well as the CPU and 2.5x the number of EUs to boot. As both chips are built on the same 22nm (P1270) process, power either has to go up or clocks have to come down. Intel rationally chose the latter. What you get from all of this is a much larger GPU, that can deliver similar performance at much lower frequencies. Lower frequencies require lower voltage, which in turn has a dramatic impact on power consumption. Take the power savings you get from all of this machine width, frequency and voltage tuning and you can actually end up with a GPU that uses less power than before, while still delivering incrementally higher performance. It’s a pretty neat idea. Lower cost GPUs tend to be smaller, but here Intel is trading off die area for power - building a larger GPU so it can be lower power, instead of just being higher performance. This is an even bigger deal because few of the other OEMs seem interested in paying for the larger die. 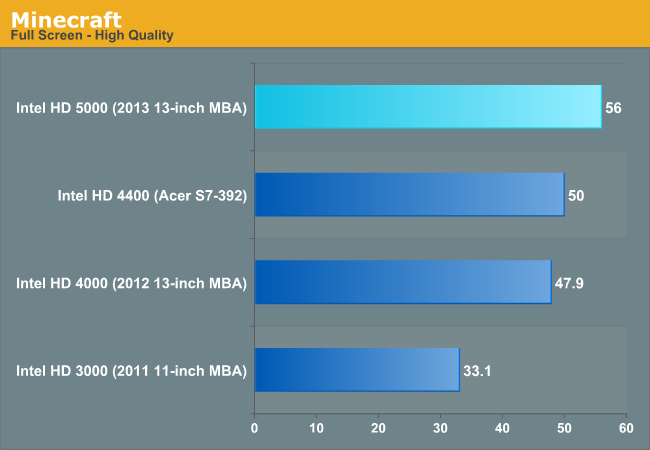 Acer’s S7 uses Intel’s HD 4400 (Haswell GT2, 20 EUs), as do most of the other Haswell Ultrabooks that have been announced thus far. Armed with a 2011, 2012 and 2013 MacBook Air as well as Acer’s 2nd generation S7, we now have the ability to compare everything from Intel’s HD 3000 (Sandy Bridge) all the way up to HD 5000. It’s important to keep in mind that with the exception of HD 3000, everything here is built on the same 22nm process, and with HD 4400/5000 TDPs actually went down. In other words, post Ivy Bridge, any GPU performance gains were very hard to come by. I’m splitting up the GPU performance data into three sections. The first is a look at some games/settings that are actually playable on processor graphics. 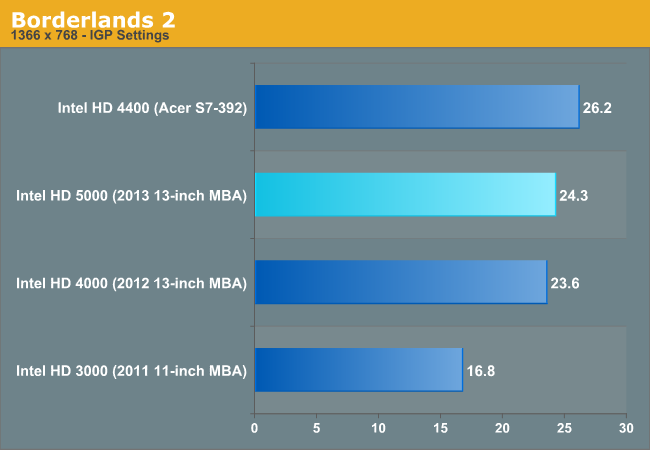 The second is comparison data for laptop Bench. The deltas here are academic at best since nothing slower than Iris Pro can really deliver playable frame rates in our high-end notebook GPU tests. The final section focuses on synthetic performance, which should help characterize the peak theoretical gains you can expect from HD 5000. All of the gaming tests were run under Boot Camp/Windows 8. I think it’s time to retire the HL2/Portal testing under OS X. There's a surprising number of games that are actually playable on Intel's HD 5000 in the MacBook Air. You have to be ok with the fan spinning quite loudly, but it's possible to get some ultra portable gaming in if you're up for it. For all of these tests I stuck with 1366 x 768 so I could run comparable data on the only HD 3000 equipped MBA I had, an 11-inch model. 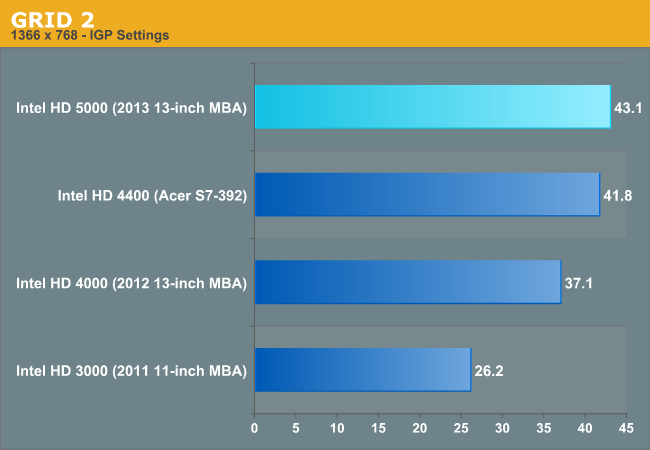 I also threw in data from Inte's HD 4400 using the new Haswell equipped Acer S7. I'll start with GRID 2, a brand new racer, running at relatively low quality settings. GRID 2 is absolutely playable on the new MacBook Air. At 43.1 fps it's 16% faster than last year's HD 4000 model. A 16% gain without increasing TDP on the same manufacturing process is pretty impressive. The gains over the 2011 MBA are substantial. GRID 2 goes from almost playable to fast enough where you can actually turn up some of the quality settings if you wanted to. Next up is Borderlands 2. Again, a fairly modern title, but one that's really optimized for current generation consoles - making high-end processor graphics more than up for the task. While a higher TDP implementation of Haswell's integrated graphics wouldn't have an issue here, things are a little more difficult with a 15W TDP. 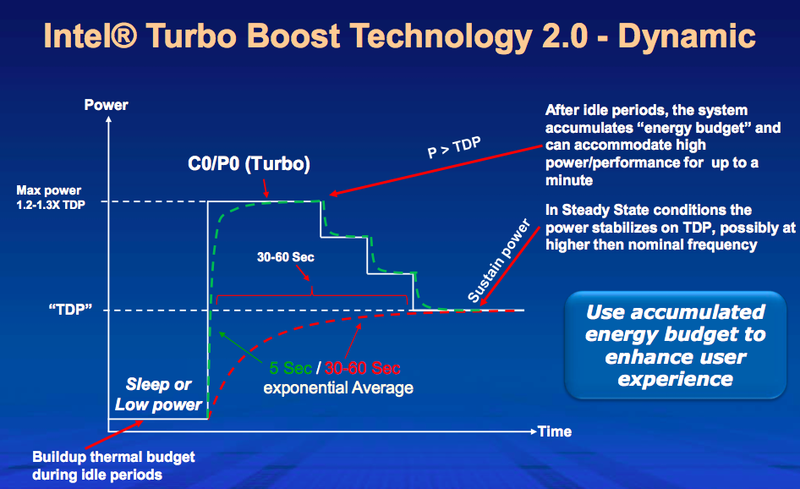 Remember, with Sandy Bridge Intel introduced Turbo Boost 2.0 that effectively allowed for two separate power limits - one equal to the processor's TDP (PL1) and one higher than the processor's TDP (PL2) that could be hit as long as the die temperature doesn't get too high. Despite the sub 30fps frame rate in this benchmark, Borderlands 2 was definitely playable on the HD 5000. It wasn't always smooth but if you need your single player fix, it'll suffice. I've had a few requests to bring back our Minecraft benchmark. We ditched it from our higher end GPU reviews since it's no longer stressful enough, but for 15W TDP iGPUs it's perfect. Once again we see almost a 17% increase over Intel's HD 4000. 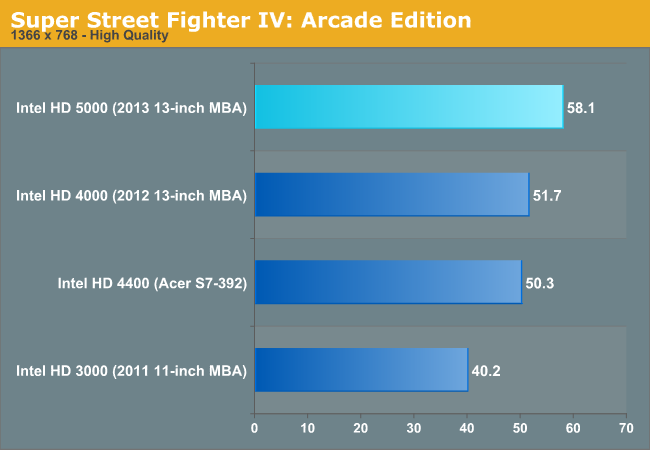 The HD 4400 comparison is also very impressive with a 12% increase in performance vs. what most MBA competitors will be using. 16% seems to be the magic number as that's exactly how much faster HD 5000 is compared to HD 4000. Given the lower TDP this year, that's a pretty reasonable gain. Looking at the sheer number of transistors that had to be used to get there however gives you good insight into just how hard it is to improve performance without a corresponding process node shrink. I find the current display resolutions on these "premium" products to be very lacking for me to actually seriously consider a purchase. At least stick something in there like 1600x900. ....1366 x 768? Come on! Also - bumping the memory up to 8GB would be nice. I know it isn't build to be a workhorse, but still. "intel came out with a new CPU, samsung made a new SSD and apple slapped it together last minute in an existing design. Ultimately, You get a slower, longer lasting air for a 100 bucks less that carries over all the little annoyances from last year." whoop dee f*ckin do……..This is apple innovation? "the m.2 spec wasnt far enough along to be used in this generation"
Oh please, What a load of horse ****. I think anand, like many other review sites invested heavily in apple stock and are now trying to stop the bleeding. Apple has been deliberately stifling user upgrades for years….That is why they have proprietary connectors…ON EVERYTHING...your readers, and your reviewer knows this. "The only thing that hasn't changed, that perhaps should have is the display. " ya think? My phone has better rez. You've been criticizing PC makers for 2 years about the 1366x768 resolution, and here we have apple in 2013 and you say they "perhaps should have changed"
-performance on par with last years MBA? 3rd tier PC makers are coming out with better hardware than apple now, this year was critical and they've dropped the ball…with the exception of the Mac pro. a smartwatch *could* be cool if it comes out totally water proof for active users…jogging swimming etc, if not i don't see the incentive to purchase unless it is super low cost. -updated thunderbolt display, USB3 and 4k Rez for under 2000 bucks. Can you name me all the other manufacturers who are implementing these features, much less doing them properly? You want retina, there's the 13" retina MBP. And I think he was criticising manufacturers for using 1366x768 res on a 13" laptop screen. Apple uses that for their 11" MBA line, which I find is still acceptable. Apple decided that a slight decrease in performance was an acceptable tradeoff for longer battery life. And I am inclined to agree with them. The new processor speed still more than suffices for what typical consumers use it for anyways. What am I supposed to do with NFC on a laptop? You want the power source to be beside the thunderbolt port. I don't think there is quite sufficient space for 2 USB ports on one side, and so long as it hooks up to your thunderbolt display just fine, does it really irritate you so that the two cables split up?